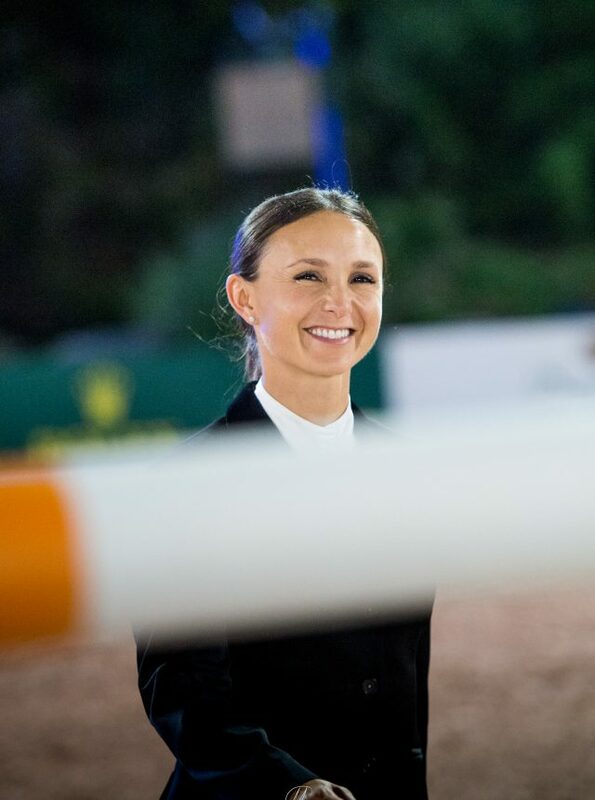 Georgina Bloomberg can definitively say that she is the only show jumping rider who attended the world-famous Met Gala in New York City on Monday, and put on her breeches in Germany on Wednesday to saddle up for a week of competition. Fitting in seamlessly at one of the world’s biggest haute-couture events comes naturally to the 33-year-old rider, who has long since struck a comfortable balance between her high profile last name and her ambitions in the sport of show jumping. 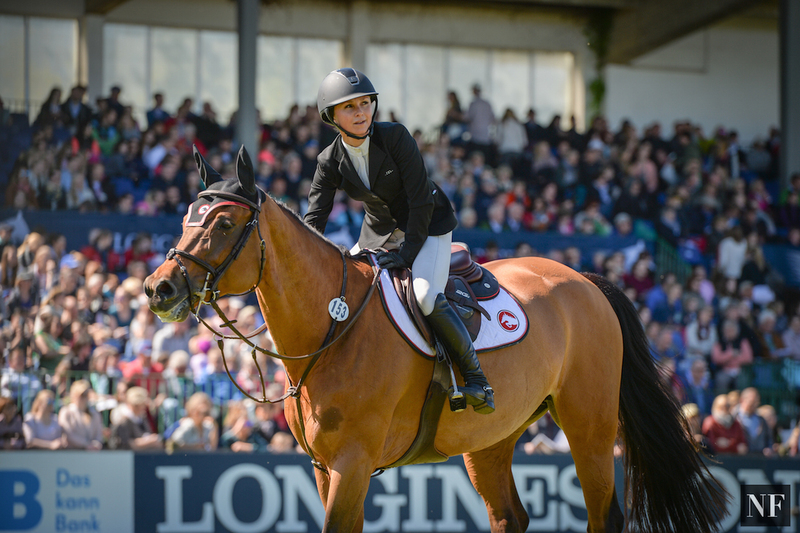 While she’s visited Germany many times, this year marks her first time competing at the Dressur Spring-und Dressur Derby, which is part of the Longines Global Champions Tour. Q: Have you been able to take some time to see the city of Hamburg while you’re here this week for the show? A: I haven’t, unfortunately. It’s one of the downfalls of our sport is that we get to travel to some amazing places, but we don’t get to see a lot of it. But at the same time, I get to go to places where I normally wouldn’t get to go, so sometimes when I can, I come in a little early to see a particular place or town. With this show, my trip is actually very short, I came in on Wednesday and have to leave right after the grand prix. I started showing Wednesday right away, so unfortunately this time there was no free time! Q: This being your first visit to Hamburg and the Deutsches Spring-und Dressur Derby, what do you think about the show so far? A: It’s a beautiful arena. We have some nice grass arenas in the United States now, but not with the amount of natural obstacles that you see here. It’s very nice to see that, and with the history behind the derby. I was hoping to stay and see that on Sunday, but unfortunately I have to leave so I’ll have to watch it on tv this year! Q: And you’re going to be riding in the Global Champions League this week, what have you thought of the GCL so far? A: I think it’s amazing – it’s been really fun. It was fun to be the home team in Miami for the kickoff of it. Right away when I heard the idea of it, I was excited for the idea. I’ve always been a big sports fan, so for me, having something new and nontraditional within show jumping was very exciting to me. Between Jan and Frank they’re both very smart businessmen and also very knowledgeable in sports in very different ways. Obviously Jan brings the knowledge of show jumping and Frank brings his experience in other sports. They’re two people who I think can really bring something to the table for show jumping. Jan has really proved that with the GCT; he has brought a whole new element to show jumping that already changed the game once and brought a new interest to it. I think that this is just the next chapter and something that’s going to be even better. Q: How has the team aspect felt for you personally? A: Purely for the Nations Cups and stuff, I’ve always loved the Nations Cups, that’s always been one of my things. Being on our U.S. team is always something that I go for. So to be a part of a team now in a different way is very cool and very different. Q: And how did the team members of your own team Miami Glory, come together? A: It’s an amazing team. Kim is someone I grew up knowing as a rider, who I could always count on as a confidant and I could go to for advice. Kent has been one of my best friends since we were teenagers. We’ve known each other for a very very long time, and having ridden on U.S. teams with him, it makes a big difference. Knowing each other’s horses and knowing each other a rider and a person and having had the experience of supporting each other on a team is very important. Scott obviously is an amazing rider, anyone would want to have him, and Jessica Mendoza as a young rider is someone who really brings a lot of fight and fire to the table. A lot of these events are about speed and she’s a very fast rider who can go in there and really go for the win. Q: How did all the members of your team come together? A: Since I was the owner I wanted to be on the team, so that was easy! And Kim rides for Frank and Monica and she wanted to be a part of it for them. And then we wanted to say that if we’re going to do this we’re going to go all in and have the best riders, so we wanted Scott to start at the top and work our way down. Scott and Kent are very good friends and wanted to go together as a package, and I wanted to bring in another American rider, who was also a friend who I could trust and who I knew would go in there and try their best every time. And when it came down to the younger riders, there’s not so many Under 25 riders who compete at the top level, but right away I thought of Jessica, she was my top choice and we were excited that she said yes. Q: Now that there have been four events and you know where you are in the rankings, how will strategy begin to come into play? 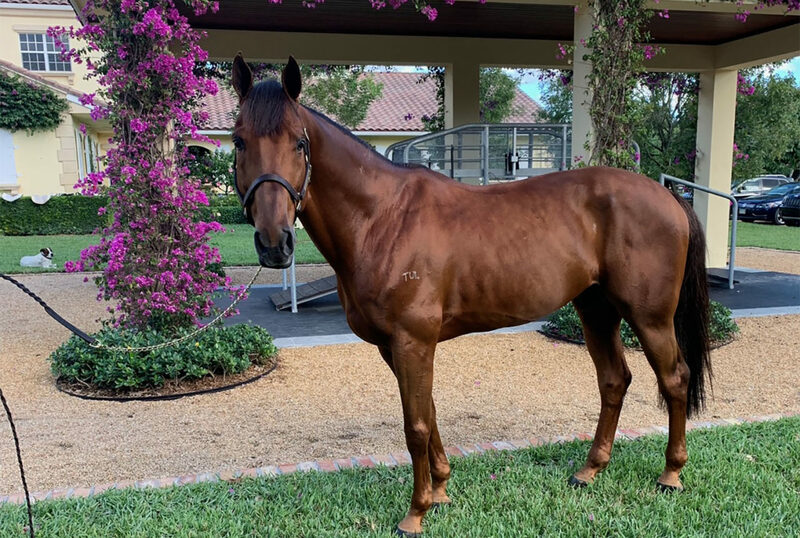 A: I think in the beginning it’s all a bit of a learning experience; we weren’t sure which competitions would be best and which horses would be better for the speed, and partly in the beginning it’s a little bit of growing as a team. If you look at all the teams across the board there are a lot of really good teams that are in the same spot or below, but as it’s still very early on and we’re still in the very first quarter of the whole league, I believe that we’ll keep fighting and continue to rise in the rankings. 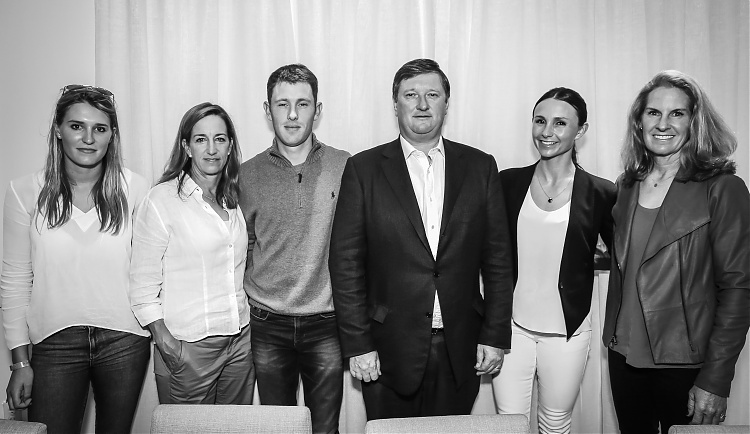 Q: What are your plans after LGCT Hamburg? A: I’m going to go home on Saturday to compete at Old Salem Farm in New York next week. And then I go to Madrid, Chantilly and St. Tropez. I’ll also do Monaco and Paris, and Valkenswaard. Then I head home and the team will do the last three GCL shows because my son starts school in September. Rio [Olympics] is not really something that is a goal for me, just because my top horse Juvina was injured a long time ago. Lilli, my top horse right now, is amazing but I don’t think that she’s necessarily ready for an Olympic Games. At the beginning of this season I really stepped back and said that I’d give the Global Champions League my all this summer. It’s something I really want to be able to focus on, and if I could make a couple of U.S. teams on the side that would be great too. For me, I think that Rio requires a very special horse, and I do have a very special horse, she is just injured. But that’s the sport and it’s part of what we do, so you have to take it in stride. I’d love to come back to Hamburg next year; I love these Global Champions Tour and it’s always an honor to be here. You definitely don’t want to be here without a top horse who can jump the big fences so we’ll see!